Don’t Touch Smoky Items with Bare Hands! Even if you are allowed to reenter the damaged building,call ERS before trying to clean anything up. Acidic smoke particulates can combine with skin oils and could irreparably damage property that ERS would have been able to save.Call or contact us by email – click the button below. Fire is a universal threat to home and business owners. Even if the fire department extinguished the fire in time to salvage your house, you’re not finished yet! Putting out the fire was just the beginning. Now you need to call the Emergency Restoration Specialists – ERS. 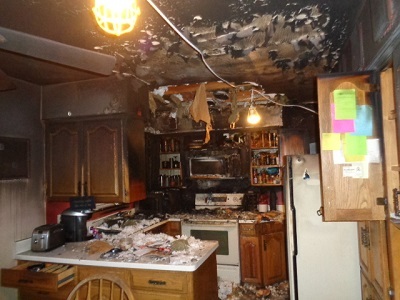 When you contact ERS, we will hurry over to the site of the fire and work quickly to restore the property. The fire department might have put out the fire with their hoses but once they leave the water still remains. This water, if left unattended, leads to damage from water. The fire also leaves behind its own damage too. Soot left over from the fire will be in all rooms touched by the fire and cover every surface in these rooms. When ERS arrives, we’ll first assess the situation to see what the best plan of attack will be. Then our restoration experts will seal off any openings in the roof or walls created in the fire. You don’t want rain pouring in through a new hole burned into the roof. Don’t let a fire threaten your quality of living and comfort. Contact the fire damage restoration contractors at ERS today, and minimize the impact of fire and smoke damage. The minute the flames are extinguished is when the hard work of restoration begins. Fire produces a dry heat, but as it is extinguished a humid and smoldering fire can raise humidity rapidly. Imagine a sauna: When water is added to heat, it produces a heavy water vapor. When a house fire is put out, the resulting raised humidity opens the pores of wood materials, allowing moisture and particles in where they can wreak havoc on your home. The experts at Emergency Restoration Specialists have the tools and the talent to remove damaging moisture from your home in all its forms. This is the inevitable result of stopping the fire from consuming your property. But it isn’t all. Carbon Monoxide (CO) – as the name suggests, gas is produced by the partial oxidation of carbon materials. Carbon Monoxide poisoning results in headache, nausea, vomiting, coma and death. Acetic acid (C2H4O2) – this organic compound a main component in vinegar and gives it its sour taste and pungent aroma. Sulfur dioxide (SO2) – an irritant most often seen in areas of volcanic activity. It has a rotten egg smell and can cause respiratory problems and even death. Benzene (C6H6) – present in crude oil and is a component in gasoline, this compound has a sweet smell. Benzene exposure is a known cause of bone marrow failures and various cancers. Formaldehyde (CH2O) – highly toxic to humans and animals alike, this compound can result in pulmonary damage and has been linked various forms of leukemia. These are compounds produced by the burning of only natural materials in your home. We could write a book on the amount of chemicals produced by burning the synthetic materials of your home. Burning synthetic materials leaves black smoke residue and toxic odors that will stick in your home for years if not cleaned. Different types of fires produce different smoke. Smoke also changes its behavior depending on the environment, and results in different smoke damage. But regardless of conditions, smoke in your home will mean odors needing to be removed to maintain a healthy living atmosphere. As fire burns, it creates dangerous pressures which spread smoke throughout the home. This is called driven smoke, which imprints its particles into the walls of your home. Floating smoke occurs when pressure building inside the burning home is equalized with the outside pressure. 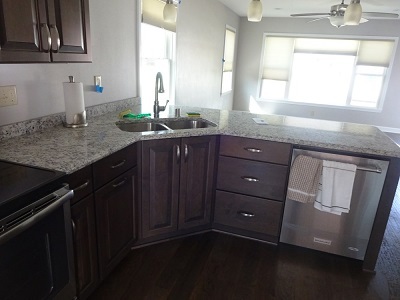 This allows the smoke particles to settle on the ground and on any horizontal surface. No matter the smoke type, ERS restores your home, carpets and furniture to their pre-fire condition. Milwaukee area home owners have trusted ERS with all of their disaster clean up needs since 1990. There’s really no avoiding the mess that will happen due to a fire and its extinguishing. But it doesn’t need to be a total nightmare. When you call ERS fire restoration services, our IICRC cleaners get to work returning the house to its previous condition. Our goal is to reduce the stress on the homeowner after disaster, and Southeastern Wisconsin has come to depend on disaster relief from ERS. If any smoke damage occurs in the home and areas are not almost immediately cleaned, the smoke and remaining soot can cause permanent damage to the property. ERS professionals begin the process of fire restoration to minimize the damage and to return the home to its previous state. A two-step process of removing soot and removing odor needs to be done correctly. In the simplest terms, restoring a home after smoke damage is about industrial grade chemicals and specific equipment. A mixture of water and trisodium phosphate will be needed before you may safely wash your items in a regular washing machine. After the clothes are in the solution, additional washing cycles will be required to restore them without odor and damage. An industrial strength vacuum is needed to remove the soot. Any attempt to scrub out the soot will imbed the chemicals deeper into the product. To do correctly, hold the vacuum several inches above until completed properly. A sealed ozone layer works best to eliminate remaining smoke particles. An extraction machine or a thermal fogging machine is the most effective way to clean all of your main surfaces. The intensity and duration of this type of treatment needs to be monitored carefully. The equipment and chemicals necessary for restoration depend heavily on the extent of the damage. Let experienced smoke damage ERS professionals take the stress out of restoring your home. Household cleaning products and deodorizers will only be a short-term fix for your damaged home. These products will counteract with soot to create even more permanent odors. Ventilation of the heating and air conditioning ducts needs to be monitored to prevent toxic fumes from remaining in the home. Humidity and dampness based on the current weather also needs to be taken into consideration. Ample covers and sealed protection need to cover the clean parts of your home or odor and smoke particles could transfer while deodorizing in other areas of the property. Airborne chemicals will be prevalent in the cleaning stages and can cause health problems. As soon as fire and smoke spreads, it is only a matter of time before the house is covered in the acidic soot. Most items will start to discolor turning to a yellow or brown shade within hours as the soot settles and begins staining. Soot is always found to be acidic. While the flames can destroy a home, leftover soot remaining on surfaces will continue to react to materials long after the fire has stopped. 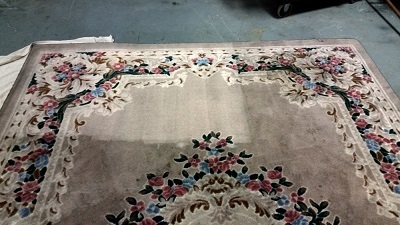 If not cleaned properly in a timely fashion, oxidation and discoloration will continue to damage all parts of the home. It will only take days after the initial spark to permanently discolor and rust the inside of the property. 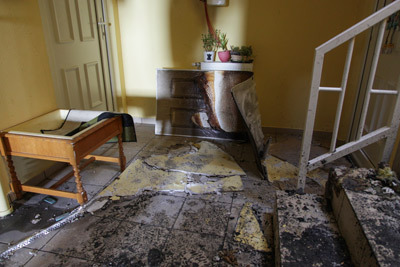 Don’t wait to repair damage – call the fire damage restorers at ERS now!